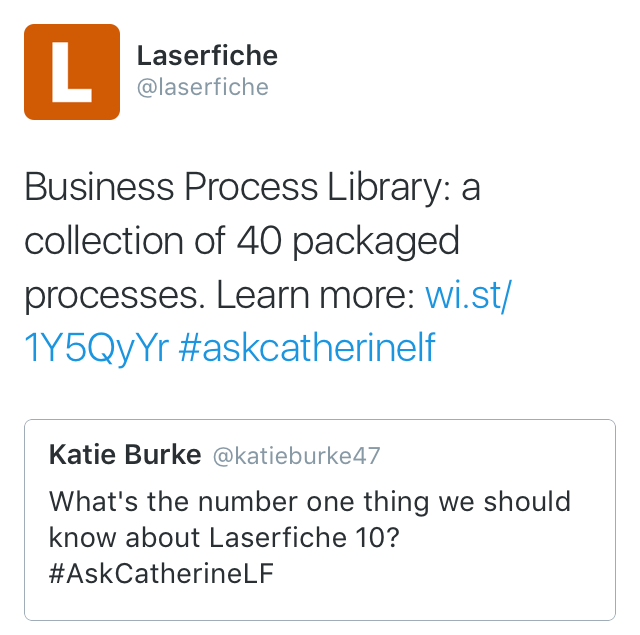 Catherine Ramos, Director of Operations at Laserfiche, joined us on Twitter for a live chat about all things Laserfiche. Participants had the opportunity to ask Catherine questions about company life, the new Laserfiche 10.1 software update, and even what Catherine is up to in her spare time (let’s just say she is putting her computer science degree to good use!). As Director of Operations, Catherine’s role includes managing the vertical marketing department, leading the Laserfiche Professional Developer Partnership (PDP) program, as well as informing analysts of company progression and customer success stories. She has been with Laserfiche for 12 years. 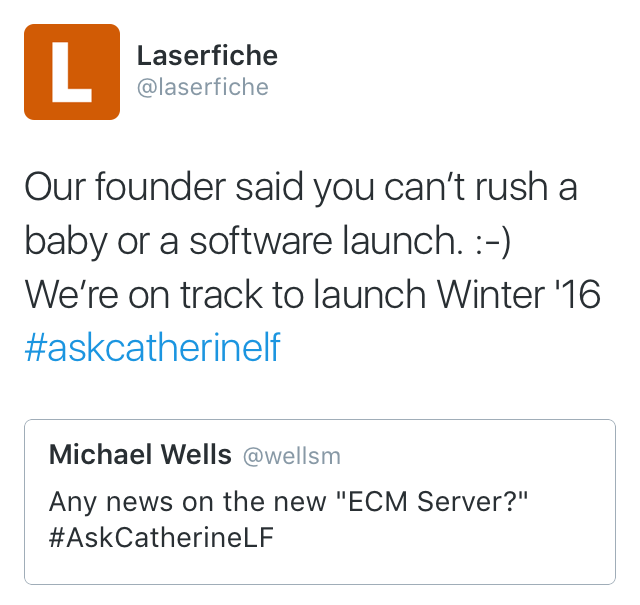 Laserfiche 10 was released in January 2016 at the Empower Conference. Its release included features such as the Business Process Library, Business Analytics, Laserfiche Conversations, and Support for Windows Mobile Devices. In the last month, we released Laserfiche 10.1, which expanded and improved features found in Laserfiche 10. The 10.1 release added even more prebuilt business process templates for a wide array of industries to the Business Process Library. The update includes a new performance dashboard to give users the opportunity to pinpoint weaknesses in work productivity and improve upon them. The update also provided the capability to work with forms offline via the Laserfiche application as well as viewing PDFs natively in the document viewer using Web Access. 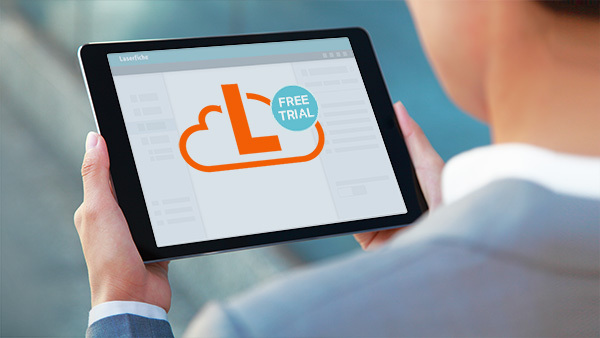 Laserfiche offers a number of resources to give you the opportunity to learn more about Laserfiche 10 and 10.1. Watch our Laserfiche Insider News Special Edition (Spotlight on Laserfiche 10.1) or read the analyst report from the International Data Corporation. The Laserfiche value-added reseller (VAR) program was recently given a five-star rating in the 2016 Partner Program Guide by CRN.com. We work with resellers domestically and internationally to build an award-winning channel program. You can learn more about our channel program and how to become a Laserfiche value-added reseller on our website. The ECM Server will actually be named the Business Process Management (BPM) Server. 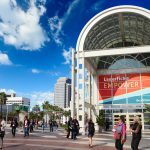 It is one of the main features expected in the Laserfiche 11 software release, which according to our Laserfiche Support Site Roadmap, “…will unify all aspects of Laserfiche Forms, Laserfiche Workflow, and Laserfiche Social BPM.” This is a good time to register for Empower 2017 and get a first-look on new product releases! 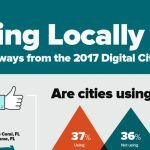 Get to know us! Watch our Life at Laserfiche video to get a glimpse of our company culture or get to know our software developers with our Laserfiche Development video. 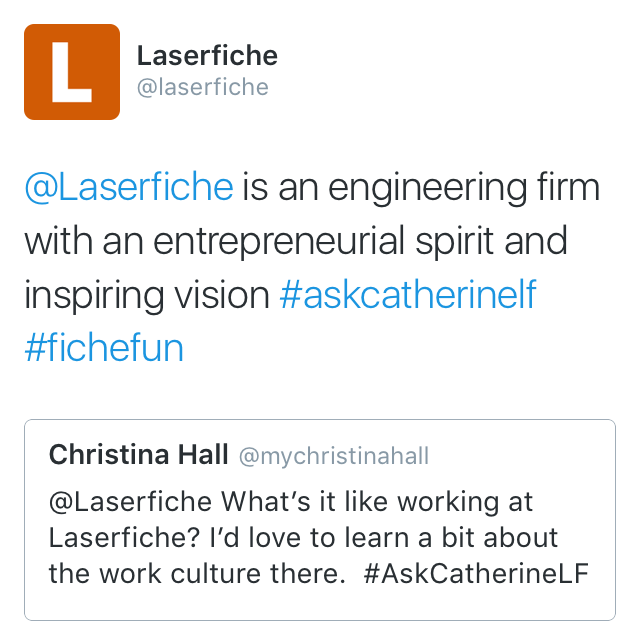 You can also check out our Laserfiche careers blog for our spotlight stories. We had a great time answering all your questions. You can check out our Twitter feed to read all the Q&As. 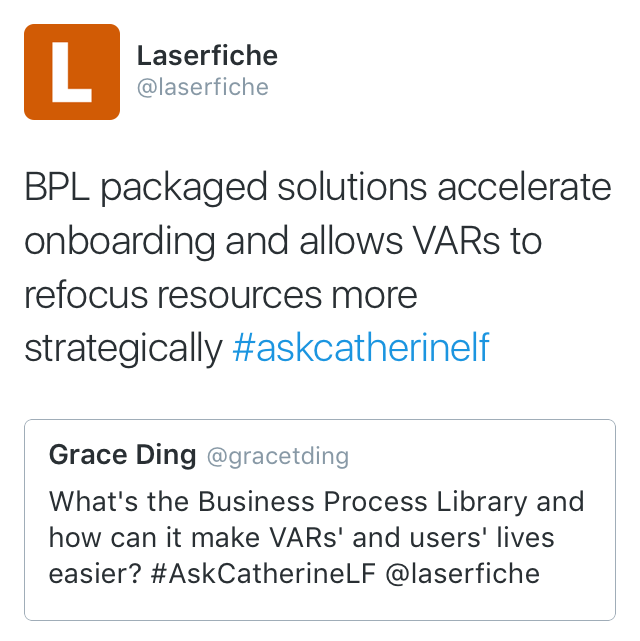 While you are there follow our page and stay up to date about what’s happening at Laserfiche. 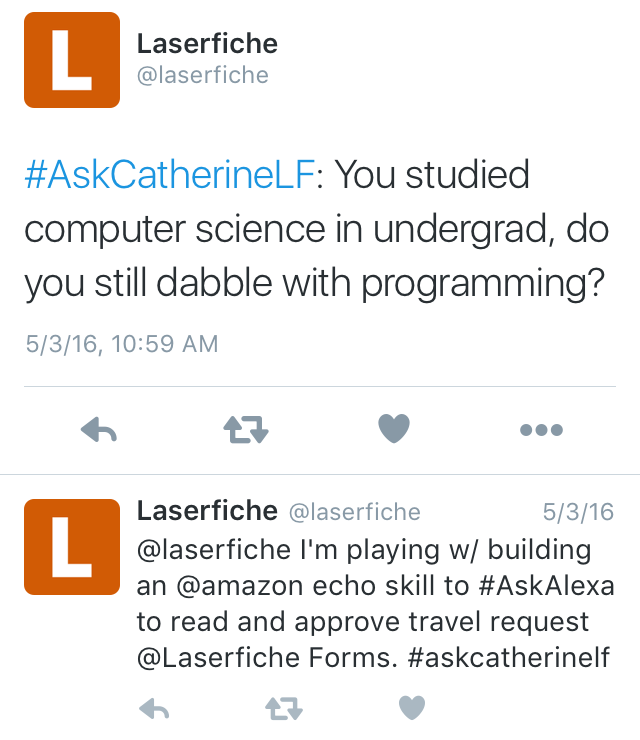 If you have suggestions for future social media chats, you can send me an email at social@laserfiche.com.